Part of the push towards rationalizing the new core rules for Heavy Gear was providing simple and easy to use rules for Infantry that allowed therm to be a part of the game while illustrating how tactically different they are from the Gears that are the focus unit of the game. The infantry rules revolve around the concept that a squad of infantry is treated as a single model even though it is composed of distinct parts (the infantrymen/women). The first rules section is Movement. Infantry move identically to walker models so they can turn any number of times per move, They can cross difficult terrain easily and can even enter buildings. Any gap in terrain that is at least the width of an infantry figure with it's small hex base allows the infantry model to squeeze through. This make infantry very maneuverable if not very fast. In addition to this infantry have no flank so it's harder to get additional dice to attack them and coincidentally this makes infantry really good at sneaking up the middle of the table through terrain to capture objectives. Additionally infantry models that are crippled will still suffer the -1D6 to their defense and attack checks but unlike Gears may still move at top speed and don't suffer a penalty to their detection range. This represents the fact that gear is spread out over all the members of a squad and though the loss of squad members reduces the effectiveness of the unit it does not remove certain capabilities. Similarly when infantry are hit by persistent damage effects the tokens will have their effects and then are removed regardless of their intensity. The damage has been done and the effect does not persist on the survivors. For haywire effects on infantry this may sound weird but you can understand it as having a number of the squad rebooting their systems while relying on the unaffected members, plus the ease of earthing haywire effects to the ground as an infantryman. The last topic concerning infantry is how to represent them on the table as a model, The classic infantry in Heavy Gear were mounted 3-4 models per hex base and a 'model' was three bases that could spread out over an area. This made it very difficult to define what the infantry model actually was. The twelve hex bases that are packaged in the blister allow for a particular construction of the unit with two bases with three figures and an additional base with four figures which includes the commander model. Here is an image of my infantry ready to be mounted. I've used the clippers to remove as much of the gate metal from the base of the infantry as possible and then finished and smoothed the figure's underside as much as possible with the big triangular file. I use the knife to trim any excess metal flash and give any slight mold lines a quick scrape to smooth them out. image 1: Almost a whole package of new Northern Infantry and Northern Special Infantry. These are the first models produced by the new mold so they are not a crisp as the figures in production since in some cases the metal didn't fully fill all the cavities in the mold. This is normal and I judged these to be passable for my use though not enough for delivery. 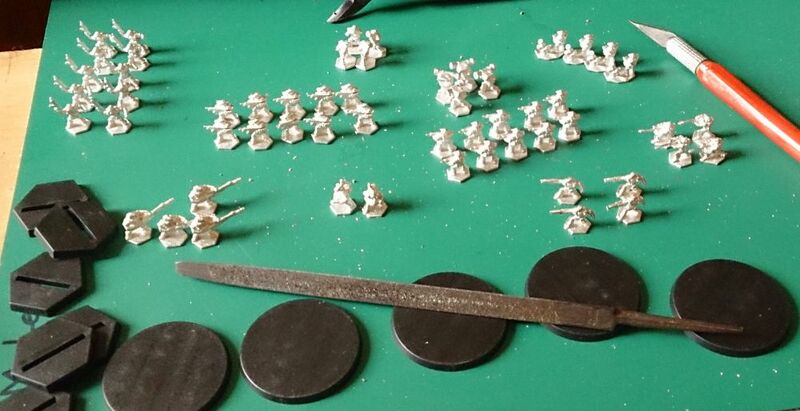 Image 2: Here I've arranged the infantry figures on three hex bases (note how they are arranged to forma single base array), ten figures on a 40mm round base, and seven figures on a 40mm round base. In the new rules you can choose to do either method. The guidelines are specific about allowing between six and ten figures on a 40mm round base because it's what looks good. As you can see placing the figures on a single round base gives the unit a more cohesive feeling. Image 3: Here is the final assembly of my North infantry models. I have two squad models of standard infantry, two anti-tank squads (with the infantry ATMs), two models of mortar squads (counting the guys with the mortar as two models due to size), two observer team units on hex bases (three models each) and four Sniper teams on hex bases (two models each). This is 50 TV in Infantry models and thanks to the Northern combined arms tactics the Infantry can be in units of only infantry or they can join General Purpose (GP) squads, or Fire Support Squads (FS). Basing on a single base also has the advantage of making the model easier to move allowing an army primarily built of infantry to be played as fast as an army of Gears. Previously you would be moving three times as many bases and it was almost impossible to play an infantry based army. The things to watch out for when using your infantry is to not bunch them up too closely or a Gear using an anti-personnel grenade laucher (APGL) will easily start removing them. Another thing to watch out for is Gears with shotguns. Your best defense when you see those is to head for the heaviest cover you can since the Frag Cannon is going to get an extra two dice to attack infantry and withe the AI trait it will remove most infantry squads with a hit with a margin of one or more (MOS:1+). Infantry also do badly against Gears when defending against melee attacks but since the AT trait of the Gear's vibro blades gives no advantage against infantry and the fact that lacking the AI trait the Gears can only do one damage on a hit. Any Gear with an APGL is far more likely to use it instead of attacking with a melee weapon. I hope you've enjoyed this little overview of Infantry in the new Beta. Alpha testers will notice that some special rules for infantry didn't make the beta cut. The best example of this is the old rule where infantry that fudged a defense roll were removed. This is gone as it was deemed unnecessary thought the list of weapons that damage infantry normally has been reduced to only weapons with the AI trait. Any blast or spray weapons that are still effective infantry killers are now clearly marked with the AI trait. Heavy Gear Infantry models are provided with hex bases. The round 40mm bases are available on the online store if you want to use the single base method. The new Beta rules will be available in Mid August at Gencon and on the online store. These Beta rules form the new standard play rules of Heavy Gear until the Core rules release in 2015. Usually when I play test games I look for examples of actions and consequences that defy expectations. One such instance demonstrated itself in a play test game last week when a PRDF Strike unit of four Warrior IVs airdropped behind the lines of the south army I was testing. I would have expected my opponent to drop in on the Visigoth on my right flank and attempt to take it out but instead the unit was deployed onto my left flank and virtually won the game all by themselves. Blog 8: March 14th update revisions. The March 14th update of the Alpha rules was swiftly followed by some quick sleuthing by some forum members who rightly pointed out that several models had been left out and there were some glaring mistakes in several files. For quick attention I have collated all the Revised units into one document: the March 14th update additional units. These were omitted entirely due to my own human error. Read more about Blog 8: March 14th update revisions. If there is a true fact about rules updates it is no rules update ever feels like it is ever complete. For early versions this can be an advantage since it means there is still time and space for changes. There are a lot of subtle changes in the March 14th update and some not so subtle ones. The Melee attack options got some work and even some expansion with rules like Crush (for infantry) and Toss (for when you want to move a target but don't want to follow). Some needed items are as simple as the separation of Split fire from the Burst trait. If the weapon has the Split:X trait you can attack X models with the weapon with one attack option. There is a -1D6 modifier to the secondary targets but it is still a powerful option. Auto cannons with rotating barrels are now in their own category called Rotary Cannons, slightly shorter range but wickedly effective. In the play test response file there is a list of play test goals and unlike most lists this list starts at zero. Goal zero is: Did you enjoy the game? This is entirely a subjective question. Enjoyment can take many forms. Enjoyment may come from a feeling of satisfaction of mastering the capabilities of your chosen army, from winning against the odds, from coming back from a serious setback to success, or just from making the best of a bad situation. In comparison there are many reasons not to enjoy a game. Spending too much time checking over complicated rules can drain enjoyment from a game. Playing a game where you have no game position advancing moves you can make,such as a standoff or a force mismatch, can prevent players from enjoying the game experience. I apologize for the delay between development blog posts but the March madness sale has started earlier than usual and the great deals are keeping the production side quite busy. But back to defense. It’s all about choice. The updated files include all the FAQ and errata generated from the last two weeks of intense scrutiny by players. The next Scheduled update is March 15th. There are several subtle changes to the rules that provide some new options as well as balancing some weapons. In addition several style changes have been implemented and some re-balancing of certain armies (Peace River, CEF, and Black Talons, I'm looking at you!). The Alpha play test is revving up, many players are reading and commenting on the rules and now it’s time to have a quick review of attacking, weapons attributes, and damage effects. How to resolve an attack in Heavy Gear is not a lot more complicated that making an opposed test for the attack and defender (s). Getting the attack to stick and do damage is going to take some work since the attacker has to fight against the natural defender’s advantage, terrain. There are several ways to improve your odds when attacking. There is nothing like a new release to get a month started. I’ve been humbled and impressed by the quality of the responses that have come in to the initial readings and games played. It’s clear we live in a connected world with responses on the forums, e-mail, messages and others. The Heavy Gear Alpha sub-forum will have logged over 350 thread responses by the time I’m done this blog post on Monday AM. One thing is clear. There’s a lot of interest. Some new faces and some old familiar ones are popping in to help out with their experience and knowledge. The sheer brain power being marshaled means only one thing: People care. It’s the most important thing to remember is that the person on the other side of the conversation also cares about the game and the setting and the little details that make it such a great sandbox to play in. We owe it to each other to debate the points honestly, respectfully, and even bluntly. More traits and a Cataphract review. Plus what you need to play! (This is a continuation of Blog #3) with blog 4 added on. Solkan is correct in his observation on the forums. “Checks have greater potential for a significant swing in results than Rolls” (paraphrased). My early alpha play testers figured out a way to get a 15D6 attack check, requiring 6+ actions, and I think that's the best they've managed (and pure theory really. If you managed all those modifiers in game then you've probably already won). When you’ve read the rules see if you can figure out how they did it. The winning answer will get all the internets. A good rule to remember is: The dice represent the potential of the action, and the result of the test is the actual result of the action. Read more about More traits and a Cataphract review. Plus what you need to play! Models in Heavy Gear are defined by attributes. Current Heavy Gear players are used to some specific information on their models data cards. I’m going to tell you now how that is changing, show the Hunter and Jaguar example models and explain what is going on with the Dice tests. First off, the Alpha does not have fancy data cards. That kind of formatting is reserved for final products, not products in development. When the Open Alpha is released this week on Friday the 31st you will also be able to download Army lists for all of the Factions. Each of these lists will include a copy of the basic army selection rules, some identification pics (to help out new players) and simply formatted tables with Models and Variants.